WINTER: So one would think that Rufous Hummingbirds all go to Mexico for the winter, right? Well, I wasn't too shocked to see that many Rufous Hummingbirds winter in the gulf coast states because I've read articles from hummingbird banders about this fairly recently discovered phenomenon. What does surprise me about their December quarters is how frequently they are reported in the mid-Atlantic areas. 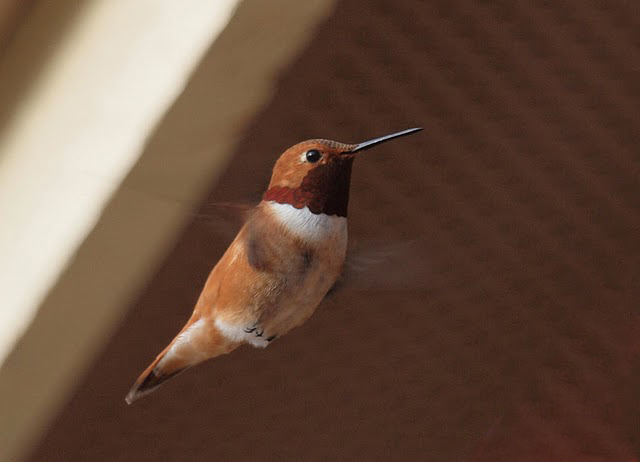 By February, Rufous Hummingbirds have moved up the west coast and I am assuming that those on the east coast have moved down into Texas, while Mexican wintering Rufous are coming back up north into Texas or the west coast. SPRING: March through May has the Rufous Hummingbird moving strongly into the Pacific Northwest, even up into Alaska. By May, almost all the southeastern and Texas Rufous Hummers have moved west. Notice that there are very few sightings in Utah during this time; hence my report triggering the eBird filter. SUMMER: I assume the June is the nesting month, but I'm not 100%. During June, the Rufous Hummingbirds seem to have most of their presence in the Pacific Northwest, with a few strong populations in Colorado and the southwestern states. Then in July and August, things get really weird (at least from my perspective). There appears to be a southern dispersal across the entire intermountain west. Even in July and August, random sightings start to appear across the midwestern states, New England, and some southern states. FALL: In September, there is still significant distribution across the intermountain west and still the random sightings east of the continental divide. In October, the Rufuos Hummingbird seems to almost nowhere, yet everywhere...as there are random reports across the whole country from eBirders in earnest. Perhaps at this point they're are so dispersed that birders rarely see and report them. By November, the Rufous Hummingbird is pushing hard back into Mexico, but also into the eastern states. As eBird use in Mexico and across the world continues to increase, these maps will get better and better. It just amazes me to discover these migration patterns. That cute little Rufous Hummingbird is quite the traveler. What other patterns can you see when you look at these maps? Please feel free to share your thoughts in the comments section. Wow - wonderful photograph and fascinating information - thanks for sharing so much and encouraging me to explore more! love your site! Absolutely fascinating. Thanks for creating those maps. They certainly convey so much more than static maps in field guides! @Barbara Selkirk - Thanks so much for the nice compliment! @Greg Gillson - one day I expect to see animated range maps on our digital field guides! Thanks for taking the time to comment. Great image and thanks for sharing the info! Was doing some routine research on the Rufous, and found your site... and it's anything but "routine"! Kudos for compiling all the info and maps, and then presenting them in a slideshow style... very effective. Isn't it just amazing how these tiny creatures manage such huge distances? Your readers might be interested in a some more info and images of the amazing Rufous Hummingbird. Thanks again for the great resources! Love your informative website! I live in Central Alabama and am just letting you know that I have had Rufous hummingbirds in my back yard the last two winters (may have had them before but never kept a feeder out before during this time of year - so, never saw any). First one arrived December 29, 2012, and all ( 3 in total) left by the first week in March 2013. This season, the first one showed up January 6, 2014, and one of them is still here as of this morning, April 1, 2014. Don't know if this last one has just decided to stay or what...lol. Can't help but wonder if this winter's three are the same three that were hear the year before.